For decades the Kennedy Space Center (formerly Cape Canaveral) in Florida has been sending astronauts into space. Among them was Neil Armstrong, on his journey to become the first man on the moon. It no longer launches astronauts (the Russians lift them into space for the USA). 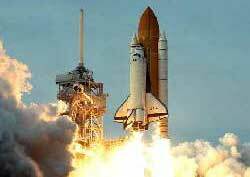 Today, it focuses on sending scientific research and exploration rockets into space. And it launches some unmanned resupply missions for the International Space Station. There is an outdoor museum of rockets standing upright in launch position. Another exhibit lets you see inside a full-size replica of a Space Shuttle. Other must-sees include a lunar module, genuine moon rocks, and a shot-in-space film projected on a 5-story screen. To reach the rocket assembly and launching areas, you board special Kennedy Space Center buses that take you on a sightseeing circuit. All the attractions seen on the tour are interesting but the Apollo / Saturn Center is the highlight of the Kennedy Space Center for many visitors. You see the now-familiar control room used for the moon flights. And, you view up-close the assembled 110-meter (363-foot) Apollo 18 moon rocket. It never got off the ground because, before it was launched, NASA decided to scrub the Apollo program and replace it with the new Space Shuttle program. The latter was eventually scrubbed, too. I was fortunate to view up close the launch of the Apollo 14 moon-landing mission. It was mind-boggling. Although there are no planned manned space launches at the Kennedy Space Center until 2017, it sometimes has unmanned ones that can been observed at the site or from the general Cape Canaveral area. See one live if you can. Watching an immensely heavy, thrust-rumbling rocket ship laboring to conquer gravitational forces is truly an uplifting experience. Click the blue link below to go directly to its website for visitor info and tickets.